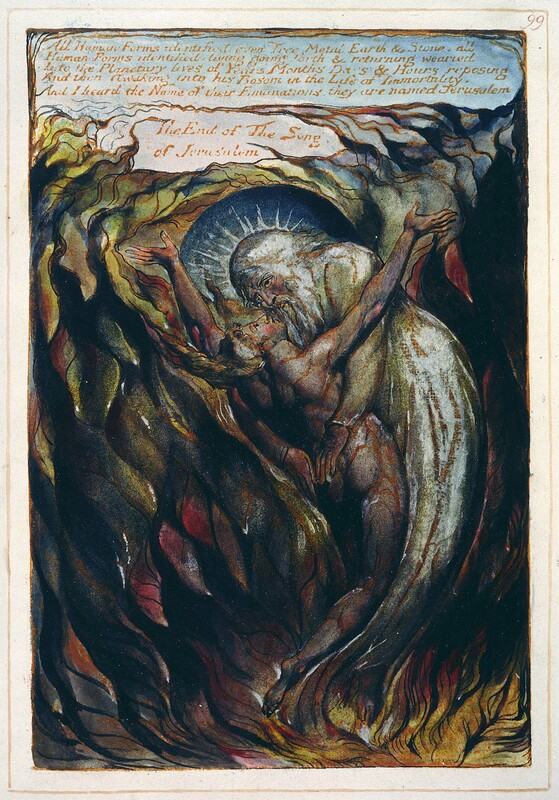 I love this image by William Blake because it speaks of what it means to unite oneself and ones desires to the will of God. It speaks of reconciliation and of union. I love the pose of the man as it is reminiscent of the cross, with his hands extended in such a way. The body speaks a language and this man’s body is saying to me that while he realizes the suffering, the cross that comes when he opens himself to God there is a peace and resting that takes place by allowing God to embrace him. The fulfillment of all desire can only happen if we unite our desires to that of God’s for us. Knowing this is one thing, knowing it as an experience is and entirely different thing. Earlier this week I had a song playing through my mind. It’s a Leonard Cohen tune called “Waiting For a Miracle.” Listening to Leonard if feels as if time slows down just a little bit and my mind quiets down. It calms me, it transports me out of the chaos of a given moment into an interior life that feels like prayer. St. Frances said when we sing we pray twice so perhaps music is it’s own form of prayer. “Waiting For a Miracle” says it all. I was waiting for a miracle to come. The way Leonard sings it, with such gentle melancholy expresses the tenderness of desire to have what I want, yet at the same time expresses the sadness of knowing that it would take a miracle. There is no begging or pleading, just a hope and desire for it. This has been my hearts song for the past week. This morning I woke up with another Leonard Cohen song singing itself into my mind. I had to smile because I felt it was a grace from God that caused it to sing me awake. It was my first thought as I opened my eyes. Became a prayer of sorts as I struggled with attacks from people that took it upon themselves to try and destroy my speaking career. I know that God has the only power to do anything. This song is my new prayer as I have transitioned into the hardest part of this miscarriage. I am still waiting, but not for a miracle to come, but for a miracle of life that was created inside of me to make it’s way out. It is the hardest for me because I wonder what I will see or worse, that I will miss him or her and flush her away. That is why it’s hardest. I just want this part to be done so I can transition to healing. When I reached for my phone this morning I saw the tweet of Pope Francis. As if to affirm that the song that was sung to me as I awoke was indeed inspired by the Holy Spirit, his “tweet” spoke of God’s will being my own. I can thank God for transitioning my heart this morning by a gift of His grace. I truly know that I want what He wants. I know there has been nothing wasted, a soul will exist for all eternity and his/her name is Kolbe and will be praying me into heaven. I realized early on in this process that I could offer this suffering to God. I solidified this during the mass yesterday when I offered my body as a living sacrifice. I offered my body as an altar upon which to offer this miscarriage as a spiritual sacrifice to God and asked for Mary to give the graces to her priests who offer themselves daily without ever being able to hold the results in their arms. I asked for the gift of spiritual motherhood to the priests in my life, that I would love them as Mary does. That I would see them as my sons that need a mother to pray for them, to love them and offer prayers and sufferings for their protection. I usually never help distribute communion, but I was inspired to do so. I felt inspired to offer communion and felt the love of my heart being poured out to every person who approached Jesus. I found myself looking deeply into each persons eyes as they came forward and felt a deep merciful love of Mary in me flow out to them. I did not look at them as they approached, I would see them. I would see their goodness and longing and desire to be filled and offer them the living God that is the only thing that can fill that void. I am in a good place today. God is Good, all the time, God is Good.